Stanton Mix! 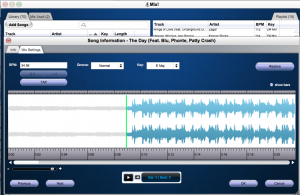 lets you plan a mixtape, mix by mix, recording the results only when you're happy. Club / Festivial DJing mix software Mix! Pro Software stanton Stanton Mix! Scratch DJ Academy MIX! 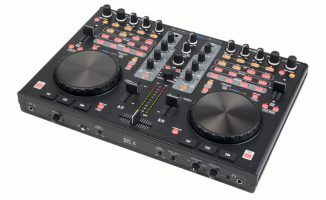 is an intriguing new piece of DJ software from Stanton, the company that made a legendary reputation for itself through its DJ record deck cartridges, but which has recently been releasing innovative DJ products such as its SCS.1, SCS.3 and forthcoming SCS.4 DJ digital controllers, as well as a range of DJ turntables including the heavyweight contender, the STR8.150. MIX! is aimed at beginners or those dabbling with DJing who want to make mixtapes rather than perform live. As such, it is in the same ballpark as software such as Mixmeister and Mixtape. Rather than doing your mixing in real time, with Mix! you work on your mix to get it right before finalising it. The program is released in conjunction with the Scratch DJ Academy, who have provided a “DJ 101” in the help file to teach beginners the basics of music theory, mixing and scratching in order for them to be able to make the most of the program. It opens as a simple-looking box, with a library on the left (you can add tunes by navigating to them or just drag them from elsewhere – I dragged a DJ playlist straight in from iTunes), your current playlist (ie what you want to feature in your mix) on the right, and a mix timeline window underneath, with transport controls (play, pause etc) at the bottom. There are no complicated menu items to get to grips with, and there’s a clear and simple Quick Start Guide that opens in a separate window too. All of this is welcoming for the beginner. 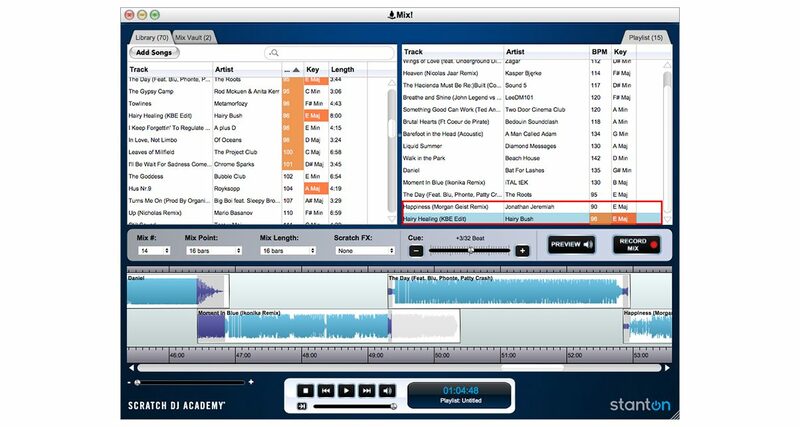 When you add music to your library, the program analyses each track to determine its BPM and key information. I added a collection of 75-odd tunes that I know well as they’re from my current sundowner DJ set, which contained a mix of house, pop, downtempo stuff, indie, dubstep and soul, in order to try and push the program to its limits. To audition songs, you can click on them either in your library, or when they’ve been dragged to the playlist window, and they’ll play, although there’s no way of quickly scrubbing through them in this preview mode. So, in order to start your DJ set, you pick the song you want to start with and drag it into the playlist window as mentioned above. Clicking on that song once it’s in the playlist window then highlights other songs in your collection that might mix well with it, either because they are close in BPM or have the same/a related musical key. The Stanton Mix! DJing 101 – designed to quickly take beginners through the very basics of DJing to help them to use the software more effectively – and to point out what no software can do for a DJ. You can choose from those, or ignore the program’s suggestions entirely; whichever, the next thing you do is drag the next tune to the playlist. As you add tunes to the playlist, they’re added to the timeline below as waveforms, like the waveforms you see in DJ software. But the clever bit is that the software immediately chooses an overlapping section, in effect deciding on a suitable automix for you. Now if you’ve ever played with automix on any of the major DJ packages, they all offer a similar thing – you put together a playlist and click “automix”, and the programs do its best – but it’s rarely something DJ software does well. As MIX! is built around automixing, though, you won’t be surprised to learn that it has a few tricks up its sleeve to help you to do a little better than the “set it and see” functions on live-focused DJ software. But before we look at how well it does, let’s return to that help file. 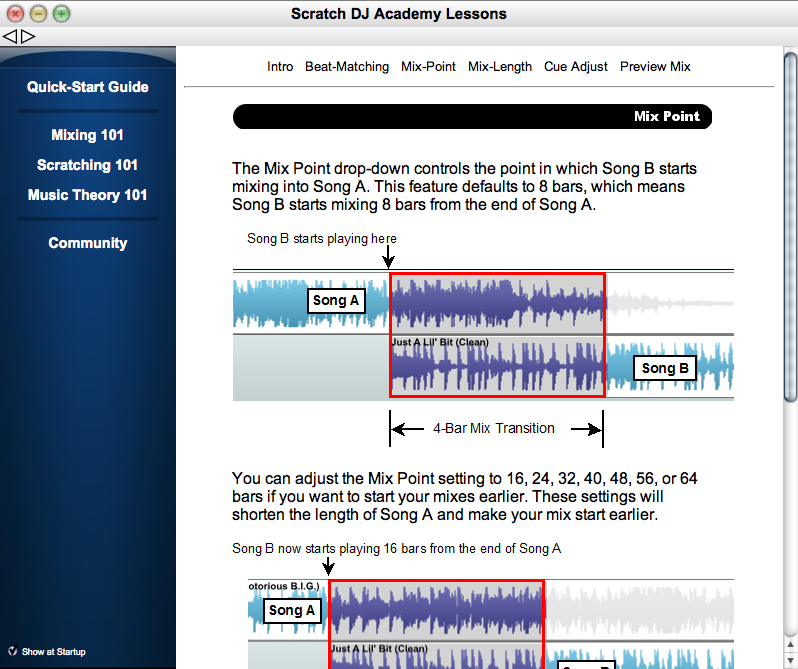 People using this program to get a crash course in what DJs do will want to read this file, as it contains a very concise summary of what it means to be a DJ as far as music theory, mixing and scratching go. The guide does a reasonable job of showing you what you need to know – the mixing section explains how DJs do good mixes, the scratching section goes over the history of scratches (but, if you pardon the pun, really only scratches the surface), and the music theory section gives just enough beats, bars and song structure/key/genre information to show the aspiring DJ what’s important when it comes to mixing two records together. The reason the above is important is that to use the program efficiently, you really do need to understand at least the basics of this stuff (maybe not scratching, but certainly the rest). However, one thing MIX! is good at is just having a go at mixing your tunes for you, and so there’s nothing to stop you experimenting with a mix, going and reading a bit of theory, experimenting again and so on. 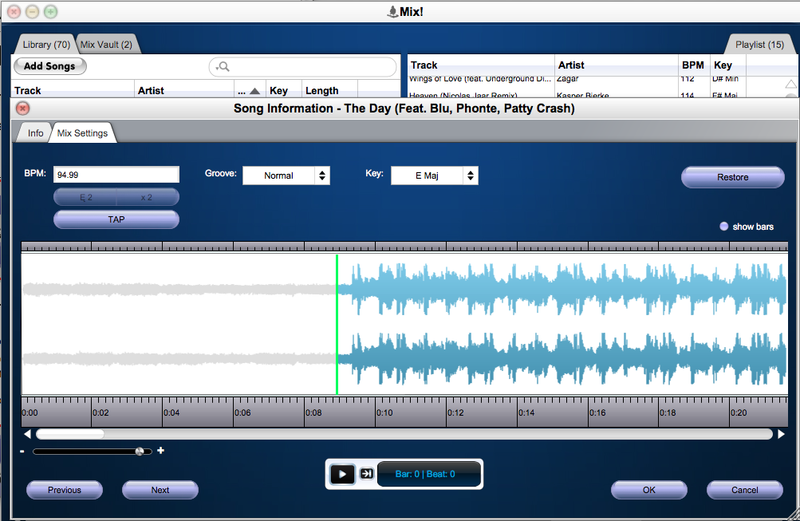 The software is pretty simple to use in this respect – mixes are numbered in a dropdown (Mix 1, Mix 2 etc) so you can jump to the mix you’d like to work on, and you get to choose a mix point, a mix length, and what Scratch FX to add (the program can add some scratching a few bars before your mix to “introduce” the next track if you wish). There’s a big “preview” button that plays your mix back to you from just before the two tunes start to mix together until just afterwards, and a cue adjusts the slider that lets you fine adjust how the tracks lie over each other – like an automatic version of the nudge button on a CDJ. By adjusting the phase this way and previewing the tune a few times, you can usually get things right. You can zoom in using a slider to see where your beats are dropping which helps you to align things exactly too. One area where programs like this struggle is in tightly beatgridding a tune – ie getting its approximation of the beats and bars exactly right. It might get it right at the beginning, but then it can kind of slip as a song progresses. This can happen with music that’s not easy to analyse, ie not simple house or techno-style EDM. The cue slider is a good workaround to thus tighten the beats up, but you need to have a bit of an ear for it and understand the theory too – hence the importance of the little 101 guide included and why it’s given such prominence by the software. Advanced beatgridding, with a key changer and even a “groove” option. To help you, you can double-click on any waveform and manually adjust the beatgridding. You’ll sometimes want to adjust start points, as the program often defaults to the first really big kick drum, which in some tunes means you miss a big chunk of an intro. Luckily you can zoom right in and drop your cue point right on the start of a transient to get an earlier cue point if you wish. You also get the chance to tap, double and halve the BPM here for where it has your reggae favourites at 170 bpm! Two interesting features in this advanced section are a groove adjuster (loose/tight/normal) and a key adjuster; the former I couldn’t hear any difference when using, but the latter allows you to select a key for your tune, and the software them resamples it into that key on the fly, meaning in theory you can match any song with any other song by just always selecting a compatible key. The key mixing is explained and displayed in a traditional format, eg C#m, F, Am. It is always better to use Mixed in Key-style key charts for DJing, as that version of this system – with a number and “A” or “B” to represent major or minor – doesn’t need reference to the “circle of fifths” if you want to work out what’s going on with your keys. A small point. This brings us on to the next point about the software; in order to offer you meaningful key mixing, and BPM mixing, it has to pull a few stunts. 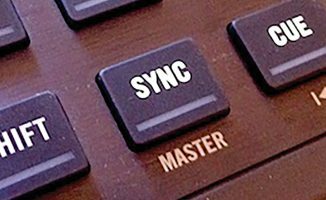 To start with, it has an auto keylock – if a song is in Fm at 0% pitch, the software holds it in Fm whether it has to speed it up or slow it down for you in order to shoehorn it into your mix. This can lead to sound quality degradation, and is just how things are when you do this – it’s the same with all DJ software, but with Mix! you get no chance to turn it off. If you apply the down and dirty technique of altering the key and using disparate BPMs to get a key-perfect mix or glue unsuitable tunes together, you may well see a lot of this going on. When the BPMs are way out, the software will make its adjustments once a mix is finished, slowly returning the incoming tune to its correct pitch, and this again causes the same type of audio degradation, as it always will when computer algorithms are resampling music; again, it’s not something particular to this software. (There’s a demo mix I refer to later on and you can hear this effect clearly in some of the mixes). There’s no looping, effects or other tricks (barring a bit of crude autoscratching) to help you with your blends, but the program does take care of levels for you, slowly fading stuff in and out and keeping the overall level constant. When you’re done, you simply hit “Record Mix” and it outputs an MP3 (at ropey 128kbps) or a WAV for you to show off to your friends and fans. In use it was a surprisingly absorbing program, due to the auto-suggestion of suitable tunes to mix next; the big, easy-to-use “preview” button; the ability to drill in and set start points; the simple fine phase adjust; and the facility to tweak the key of tunes, letting the program adjust pitch for you as you go along – all of which gets you right in there, experimenting and having fun. My DJing style is across all types of music, and all tempo ranges, and when I DJ live, I have certain techniques to let me play such a wide range of material; using this program, I found myself really pushing the boundaries as I navigated my collection, and it was quite a lot of fun spending a morning trying to put together an hour-long demo mix within the limits of what the program can do (you can hear the results in my Sunset Rocks Spring 2011 mix) on Mixcrate). The only thing I found really annoying was a bug whereby sometimes you weren’t allowed to let a record play out because you couldn’t drag the right-hand part of the mix area right to the very end of the outgoing track, leading to more abrupt endings than would have been ideal. It was a pre-production version of the software that I reviewed, so I hope this will get corrected by the time it is released. MIX! is a worthy little program. It doesn’t pretend to turn you into a DJ, but it does introduce you to all the key concepts of DJing, and lets you get a mix done and down quickly – and with a little care, a mix that sounds really good too. For music fans who want to make mixtapes, it’s great, and by that, I mean music fans of all types, not just people wanting to beatmix electronic dance music. For the latter crowd, however, the program makes it simple to do passable house or electro-style mixes at a lightning pace, with very little traditional DJing skill. It’ll make you realise how important it is to know and understand your music, though. 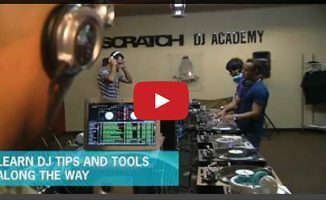 The Scratch DJ Academy: With their name on the box, they’re obviously hoping you’ll get hooked and move upwards to a training programme. For professional DJs, it’s actually a useful way to plan and experiment with a set of tunes, because you can practise long key mixes, and sort the programming out for a new group of tunes, quickly outputting a file to listen to later on as you get to know your material. As such, it would be a good scratchpad if you’re planning a mixtape, even though you’ll go off and complete it elsewhere. Where the program really shines, though, is as an introduction to DJing for those who will then hopefully decide to then go on and learn more. 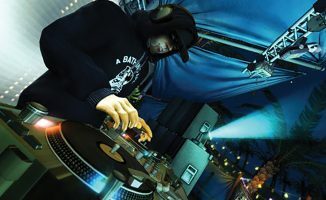 By showing you the concepts, and then letting you experiment with your own tunes to produce passable results, it is likely to encourage music lovers who have always wanted to DJ but who otherwise may have thought it’s too hard to learn, or those who would otherwise have had a go and got bored or frustrated. It’s no surprise that a DJ school has put its name to this, because I suspect many beginners will buy MIX!, put together a mix or two, and then get hooked, realising how much there is to learn and how much fun it can be… and then be knocking on the door of a DJ school, or go off to buy real DJ gear to carry on their learning. How do you build your mixtapes? Do you mix them live or do you use software to assemble them piece by piece? Do you think beginner DJs should learn using software like this or should they learn to beatmatch and mix the old way? Let us know your thoughts on Mix! and the best way to start DJing in the comments below. Well spotted Jeremy, not sure what the F went on there! 😉 Thanks for the correction.